There are 28 posts in this thread, and it has been viewed 34939 times. There's also files attached. How do you feel about Samurai Shodown? NOTE: This was a previous Game of the Week thread! Also available on the Wii Virtual Console as well as SNK Classics Vol. 1 for the PS2/PSP, as well as many ports to other systems at the time. 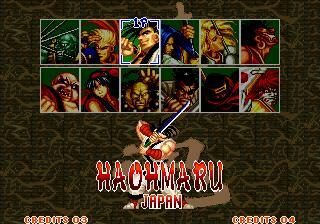 In 1993, a weapons based fighting game was released into arcades, cementing SNK as one of the best developers around. Samurai Shodown was the name, and although it has since been surpassed (in my opinion at least) by many of its sequels, it is a true classic. 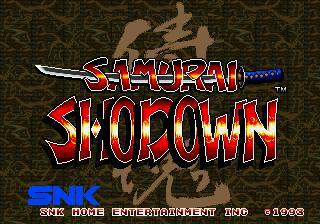 Samurai Shodown music is available in the SNK Jukebox! I first played this game on my 3D0, it was very playable. The controller I had for the 3DO was the streetfighter 2 pad. The Neo pads just don't feel as responsive with this game, so I don't really enjoy SS1 on the Neo. I have the large Neo rectangular controllers and the smaller snes shaped pads too. Does anyone have any views as to what the best responsiveness pad/stick is out there for the Neo? What's the rules too about posting queries like this in threads which are about something else?! It's ok to ask, although you are more than welcome to open up a thread for it. Usually if a thread gets sidetracked a little too much from the main subject I would suggest opening a thread so it can be talked about more in depth there! As for the control on Samurai Shodown... I really do find the classic Neo Geo stick by FAR the best controller for it. I can barely imagine playing the game any other way. My local arcade had only Samurai Shodown IV and i really liked it. I didn't play first game much but i can play it while it is game of the week. I really like Shodown 1. I don't know why but for some reason I think it looks better graphically than its sequel. I asked my brother to get me Samurai Shodown II, and he got this one by mistake. I think I like the front cover better, but I haven't really seen it since he got it for me. Just out of interest how do people hold their Neo Geo sticks - I always use a couple of fingers and thumb, but I always wonder if I am holding it right. I've always wondered if anyone goes for a full handed hold. I'm not sure I could move it so accurately with that. The first Samurai Shodown really is a classic game which even though it's been improved upon by later games in the series is still great fun to play. The character designs are varied and very appealing my favourites being Nakoruru, Galford and Hanzo. The idea of characters having animals which fight alongside them was a great idea. Graphics look very nice and of course the zoom feature looks impressive. I love Haohmaru's/Ukyo's background on the shore with the mountain in the background and waves crashing against the rocks. That still impresses me every time I see it. I like the fact that there are bonus rounds in this game. It adds a little bit of variety. Why did bonus rounds go out of fashion? I sometimes think this game sometimes gets a little bit overlooked. I think people new to the series should definitely start with this first installment...a classic fighting game and the start of one of the greatest series of fighting games ever made. I do the same RiKo. I just use my thumb and a couple of fingers on the stick. That seems fine to me. david414e like Kaz said the original Neo joysticks are the best. The stick and buttons are very responsive. One of the best joysticks I've used. "No one calls me a freak and lives, no one but my wife"
I had this on the 3DO originally (along with SSFIIX/Turbo). Aside the loading times form the CD, this was a very good port, as the graphics were super sharp and the SFX & Music were CD quality too. Seeing as I got SS1 a fair few years after SS3 (and SS2 wasn't available on much but AES/MVS) I didn't really enjoy it as much as I felt 3 was a massive advancement. 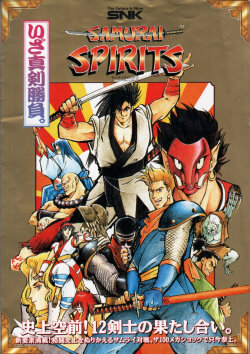 I recently got the Samurai Spirits Rokuban Shoubu (SSanthology) for the PS2 and played all 6 (except Vspecial ) back to back. I liked 3 & 4 & 5 the most over 1 & 2... and 6 I just dont get?! I prefer 3 & 4 due to personal preferences like the change in art direction, the 4 button combat system... it just makes more sense, 2 versions of each character (my faves being 'Treacherous' Galford (no poppy) & 'Chivalrous' Kazuki (the man! ), and I prefer the character rosters and the way they play in 3 & 4... they just feel so much better imo... I like how the attacks feel deeper and more impactful... and 3,4&5 feel more (weird I know) neo-geo... you know, big beefy characters, OTT SFX, awesome soundtrack etc. 5 is also good but I miss the 2 versions of 1 character. I rarely play it today, cause I always get emotional when I play it, and I want this to stay something special. Objectively I think SS4 is the best of the series. Its the music, the graphics, the characters, the atmosphere...just everything! Hello Yao - nice to meet you You can post a thread about yourself in the Arrivals/Departure section of the site - so we can all welcome you. Enjoy the site - It sounds like you really like Neo Geo. 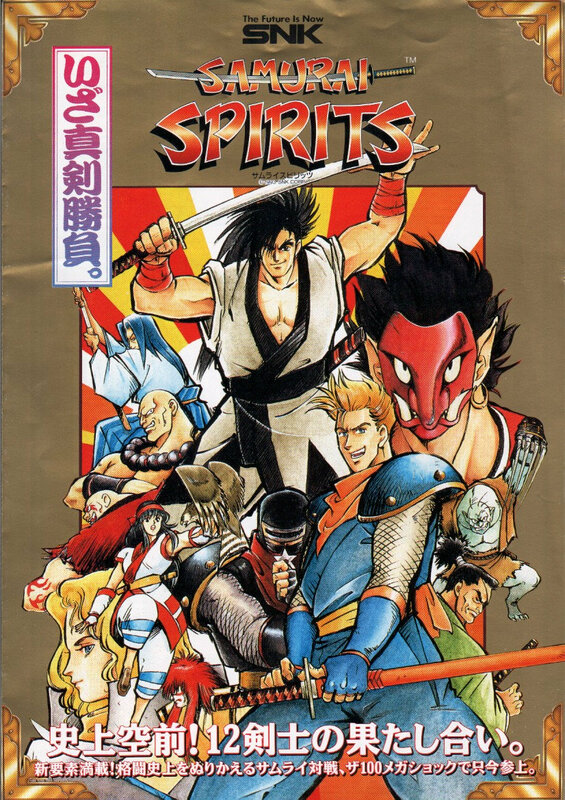 Well I played Samurai Spirits/Shodown for the first time today. I haven't got used to the way it plays yet which is a lot different to other fighters. The enemies block me a lot which can be a bit annoying. What does the super bar do? I can't find any supers (yet). This is an earlyish game so maybe it doesn't have supers? I absolutely love the backgrounds - all other fighters should take note of the variety and the beautiful scenery. The music and sound effects are all excellent too. 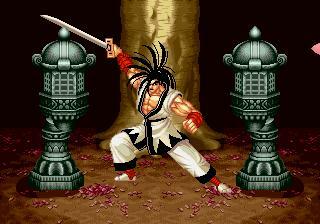 After playing Samurai Shodown 4 for a long time i can say this: Why Nakoruru is so big or tall? I prefer little Nakoruru. Yes its true I really love the NeoGeo. I will soon post a thread in the arrivals section so that you guys all know a little something about me. SS2 still gets most of my attention, but SS1 will always get brownie points from me. Brilliant and seemingly as good as "2", but probably not after extended play. The only problem with this series is working out the order of the games and what equates to what in each region. Although I have a Jap SS2, and the title screen says that (I have a US AES), the box seems to suggest its title is not SS2 but something far more complicated, Can someone please point me to the definitive answer? I feel that SS2's difficulty setting gets too high too quickly, I feel I need to use the most rangiest attacks and then repeat quickly jumping back. I fear I may never get past about the fourth fight on about difficulty setting 3! (I could beat most peopple on streetfighter 2 on the snes with one hand, i.e. just use the d stick and the L shoulder button alone) this must say something about this game, am I mising the point? 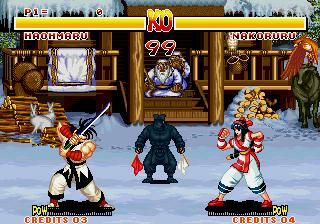 The only Samurai Showdown I've played was the first one for Neo Geo, and I also played the first one on Super Nintendo, however, Its an awesome Neo Geo game, I really liked it, even tho some of the songs are annoying ( Two notes only.. ) reapeatitiveness. I really liked the combat, I voted : Not bad but not great Because I din't play Samurai Showdown 2-3-4-5-6, only the first one, but I seriously intend to buy Samurai Showdown Anthology, Because its overall a really fun game, I hope to learn more about the series when I'll buy the Anthology, because its really interesting and its one of SNK's biggest classic games. Whats the deal with Anthology? Has it ever seen a PAL release? It will do: http://www.igniti...m/home.htm (click on the red 'click for more games bar at the bottom of the page. As you can see, Ignition plan to release KOF98:UM too, which is great news for us all in the UK (I already have the JAP version, but I always buy the UK release too.) It also means my friends, who cannot play JAP games can buy this game and play it too... which means eventually VS goodness!